ICA is always Free. For All. Free admission is courtesy of Amanda and Glenn Fuhrman. Marketing is supported by Pamela Toub Berkman & David J. Berkman and by Lisa A. & Steven A. Tananbaum. 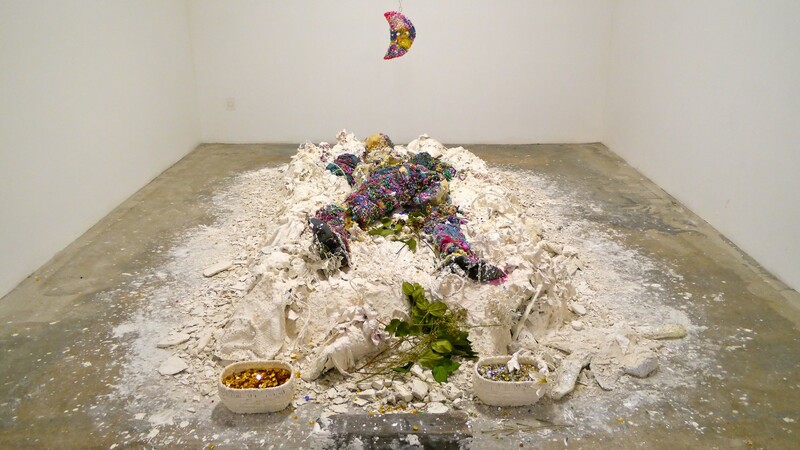 Raúl de Nieves, Celebration, part of I'm in a Story, plastic Mardi Gras beads, concrete, flowers, metal chain, fresh flowers, 2010–2015. Photo by Raúl de Nieves. Over the course of six months, five participants—Raúl de Nieves, Danielle Goldman, George Lewis, The Otolith Group, and taisha paggett—will oversee an unfolding series of performances and encounters within ICA’s exhibition spaces. A performance in seven acts by Raúl de Nieves, Micki Pellerano & Monica Mirabile, presented in collaboration with Sigrid Lauren, Tara-Jo Tashna & Kathleen Dycaico, narrated by Chiara Fumai. Jake Dibeler grapples with pop culture, queer body politics, death fantasies, and an uneasy interplay between humor and horror. Raúl de Nieves presents his performance The Fly. 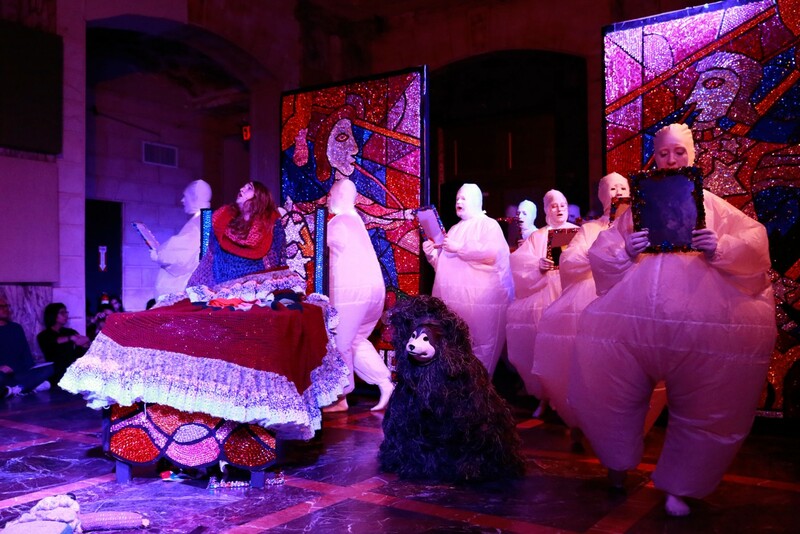 New York-based performance artist Whitney Vangrin presents her performance Mother of Vinegar: 2nd Sequence. Raúl de Nieves and Erik Zajaceskowski as Somos Monstros present Ceremonial Metal of Alien Exits. Performance supergroup HARIBO, featuring Raúl de Nieves, Jessie Stead, and Nathan Whipple, presents their performance Soap Opera. Virago-Man Dem is a nuanced study in masculinities, their multiplicities within cultures of Caribbeanist and African American communities, and black masculinities in general as they are performed and expressed by men, staged on male bodies, but designed and interpreted by a woman. The performances will take place on Jan. 11 at 12, 2, 4, and 6PM in ICA's galleries. Virago-Man Dem is a nuanced study in masculinities, their multiplicities within cultures of Caribbeanist and African American communities, and black masculinities in general as they are performed and expressed by men, staged on male bodies, but designed and interpreted by a woman. The performances will take place on Jan. 12 at 1, 3, and 5PM in ICA's galleries. 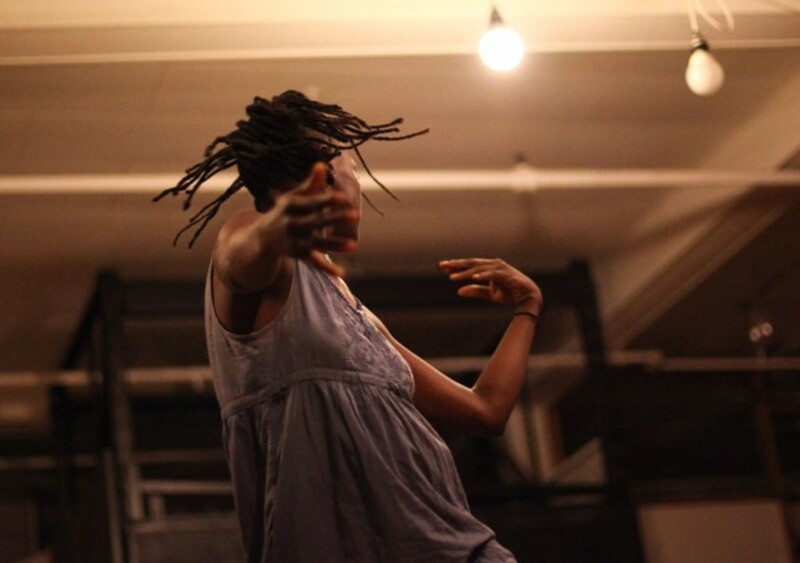 Let 'im Move You is a series of works choreographed by Jumatatu Poe and Jermone Donte Beacham that stem from Poe's seven-year research into J-Sette performance. 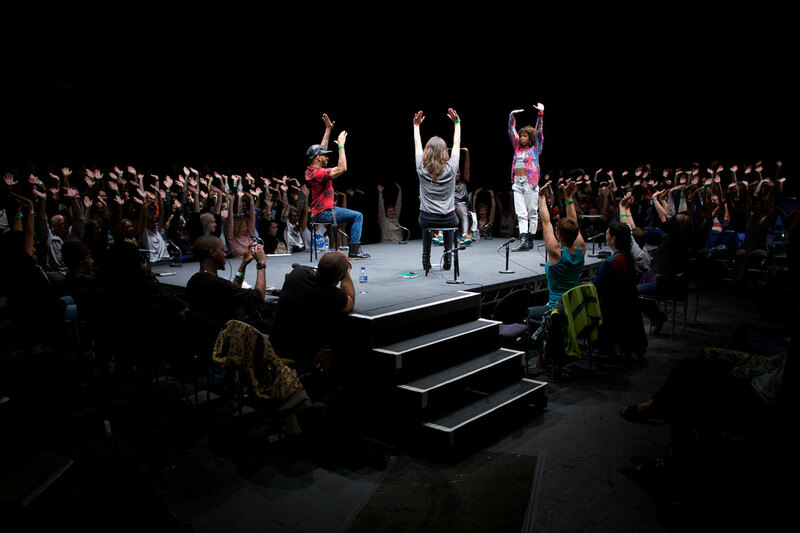 Poe and Beacham use J-Sette movement & performance structures as jumping off points for experimentation with the role of strategy in dance making and social design. taisha paggett and Meena Murugesan present a replica of a rehearsal over two days within the gallery. Though there are scheduled start times (1PM and 3PM), the actions in the gallery will unfold over the length of the entire day, doubling up and building upon material send and displayed at ICA by taisha and Meena from rehearsals in California prior to arrival in Philadelphia. 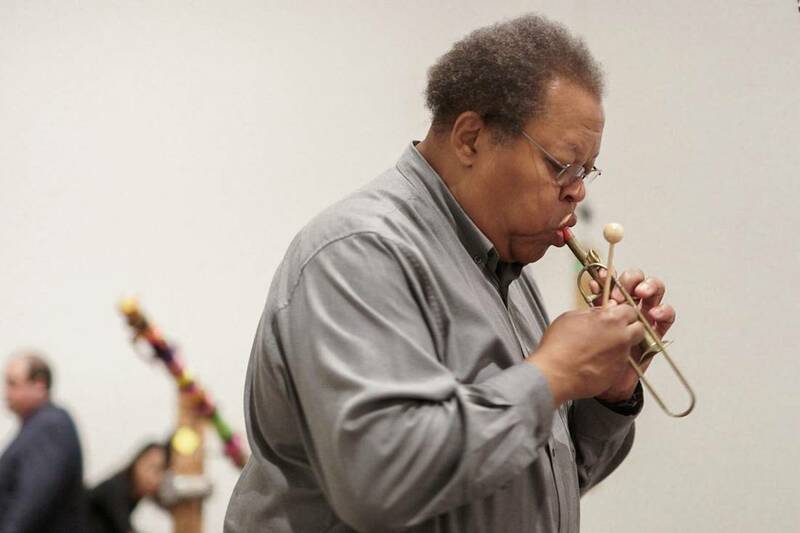 George Lewis (b. 1952, Chicago, IL; lives in New York, NY) is the Edwin H. Case Professor of American Music at Columbia University in New York. 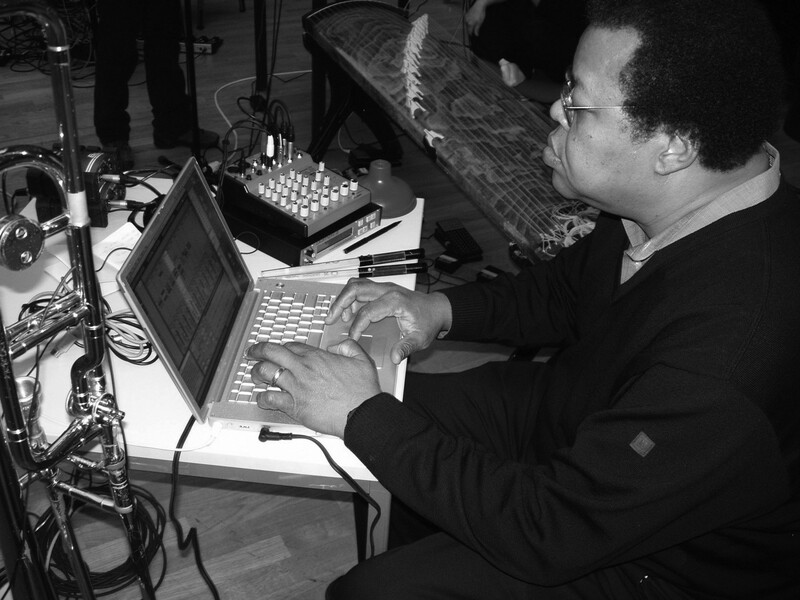 A member of the Association for the Advancement of Creative Musicians (AACM) since 1971, his work in electronic and computer music (including the widely influential interactive improvisation software, Voyager), computer-based multimedia installations, and notated and improvisational forms, is documented on more than 150 recordings. 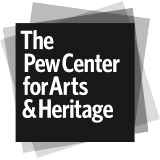 A 2015 Fellow of the American Academy of Arts and Sciences and a 2016 Corresponding Fellow of the British Academy, Lewis has received a MacArthur Fellowship (2002), a Guggenheim Fellowship (2015), a United States Artists Walker Fellowship (2011), an Alpert Award in the Arts (1999), and fellowships from the National Endowment for the Arts. His work has been presented by the Museum of Contemporary Art Chicago, BBC Scottish Symphony Orchestra, London Philharmonia Orchestra, Radio-Sinfonieorchester Stuttgart, London Sinfonietta, Contemporary Arts Museum Houston, Talea Ensemble, Ensemble Pamplemousse, Wet Ink, American Composers Orchestra, International Contemporary Ensemble, Ensemble Either/Or, the 2010 Vancouver Cultural Olympiad, IRCAM, and many others. ENDLESS SHOUT: George Lewis from ICAPhiladelphia on Vimeo. 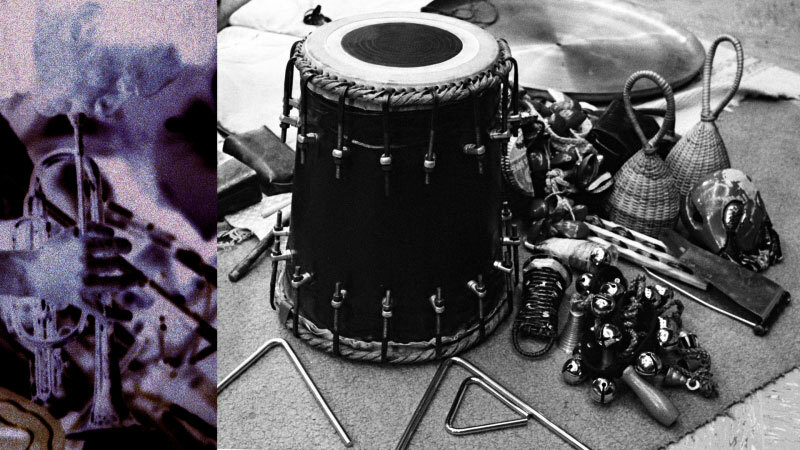 Lewis is the author of A Power Stronger Than Itself: The AACM and American Experimental Music (University of Chicago Press, 2008), a widely acclaimed history of the collective from its local beginnings to its eventual ascent to international prominence, which received the American Book Award and the American Musicological Society's Music in American Culture Award. He is the co-editor of the two-volume Oxford Handbook of Critical Improvisation Studies (2016), and most recently, his opera Afterword (2015), commissioned by the Gray Center for Arts and Inquiry at the University of Chicago, has been performed in the United States, United Kingdom, and the Czech Republic. In 2015, Lewis received the degree of Doctor of Music (DMus, honoris causa) from the University of Edinburgh. Raúl de Nieves, XPRM/E/N/TAL, MoMA PS1, 2016. Photo by Walter Wlodarczyk. Brooklyn-based multimedia artist Raúl de Nieves (b. 1983, Morelia, Michoacán, Mexico) is known for his highly theatrical musical live performances and visual work that spans large-scale figurative sculpture, narrative painting, and ornamental shoes and garments. Before migrating to San Diego at the age of nine, de Nieves learned from an early age how to create things with his own hands, and learning to knit, crochet, cook, and sew would play a pivotal part in his art. De Nieves’ meticulous sculptural creations are made from tiny, individual, colorful plastic beads held together by glue. The ornamental shoes and garments he creates through this process derive from and are often worn in de Nieves’ decadent performances. In his most recent exhibition, El Rio (Company Gallery, NYC), de Nieves renders sociopolitical themes and his multicultural background in vibrant, highly saturated color palettes. This overall approach of negating austerity with playfulness is demonstrated in de Nieves' musical counterpart to his visual works. De Nieves is a member of the three-piece art-rock band Haribo, a group known for ephemeral, stream-of-consciousness theatrics grounded in improvisation and over-the-top live performances that often feature de Nieves’ self-designed costumes and footwear. 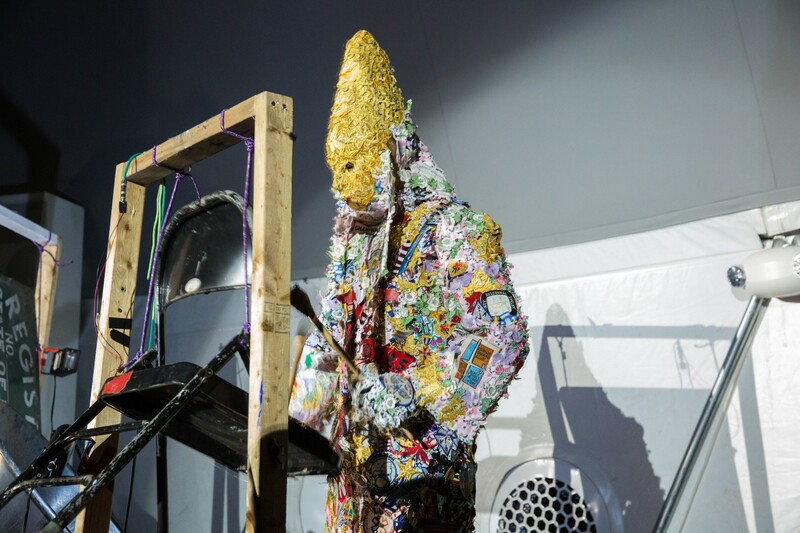 Raúl de Nieves, The Fool, collaborative performance with Colin Self, part of Issue Project Room Air residency, 2014. Photo by Lucas Blair. De Nieves has exhibited widely, including at Mendes Wood DM (São Paolo), MoMA PS1, The Museum of Art and Design, Rod Bianco (Oslo), Shoot the Lobster, and elsewhere. He has also performed at Artists Space, BOFFO, The Kitchen, MoMA PS1, Performa 13, Real Fine Arts, and numerous other venues. ENDLESS SHOUT: Raúl de Nieves from ICAPhiladelphia on Vimeo. A collaboratively written 60 minute opera starring Colin Self, Raúl de Nieves, Alexandra Drewchin, and Mehron Abdollmohammadi. Chorus: Lisa Kori Chung, Stephen Wood, Andy Kuncl, Cheno Pinter, Xena Semjonova, Sarah McSherry, Rogielo Ramos, Michael Bunsen, Daniel Wallace, Mz William Fortini, Ana Lieberman and Lindsey Leonard. Ensemble: John Swartz (cello), Thomas DeLaney (cello), Liza Paap (violin), Genevieve Kammel Morris (viola), and William Nagel (cello). Conductor: Brian McCorkle. The Fool was collectively written by de Nieves and Self with several musicians and singers. The selection included here is one of several sections collaboratively scored through de Nieves and Self bringing ideas and texts to a group of singers, who then shaped the melody, added words and phrases, and reformed the performance. De Nieves is interested in more informal engagements for getting strangers to sing together in public for Endless Shout. Dancer and educator Danielle Goldman navigates her way through improvisational dance and performance with a scholastic approach that challenges certain conceptions of a history that has often overlooked both fields as accepted forms of art. Goldman, who received her B.A. in Philosophy from Stanford University and her M.A. and PhD in Performance Studies from New York University, has appeared in numerous group and individual dance performances throughout her career—most recently in choreographer Sarah Michelson’s Tournamento performance in 2015. Goldman is the author of I Want to Be Ready: Improvised Dance as a Practice of Freedom (University of Michigan Press), in which she deconstructs improvisational dance by linking it to the binary notions of freedom and constraint, using a symbiotic framework that traverses experiential knowledge of dance and academic theory. Electric Midwife, Chocolate Factory in Long Island City, Queens, 2011. Photo by Julieta Cervantes. Goldman’s scholarship has been featured in several publications, including Dance Research Journal, Movement Research Performance Journal, Women & Performance, TDR, and the Oxford Handbook of Critical Improvisational Studies, co-edited by fellow Endless Shout participant George Lewis. ENDLESS SHOUT: Danielle Goldman from ICAPhiladelphia on Vimeo. Currently, Goldman works as a professional dancer in New York City and serves as Associate Professor of Critical Dance Studies at The New School, where she is focused on research about the spatial relations of 1980s dance movements in the different boroughs of New York City. 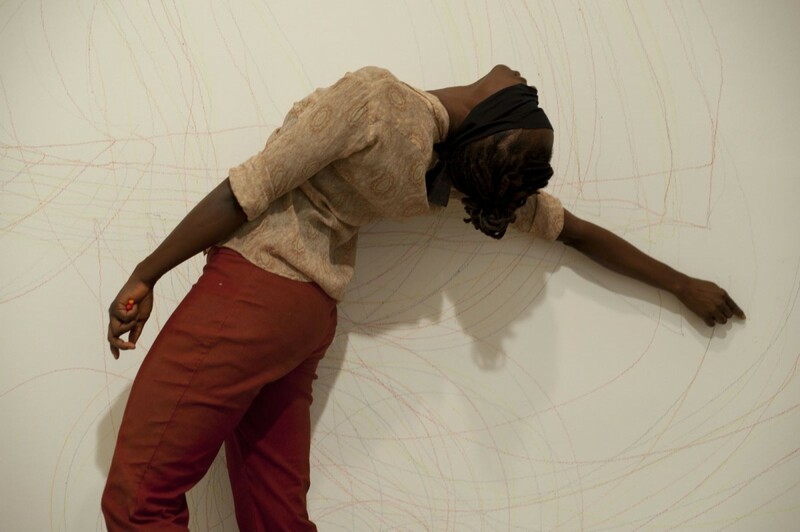 taisha paggett, Quadruple-Consciousness, Vox Populi Gallery, 2011.
taisha paggett (b. 1976, Fresno, CA; lives in Los Angeles and Riverside, CA) confronts issues of the representation of black bodies in dance through an interdisciplinary approach that connects the movement of performance with elements of visual art carried out in diverse types of spaces and formats. 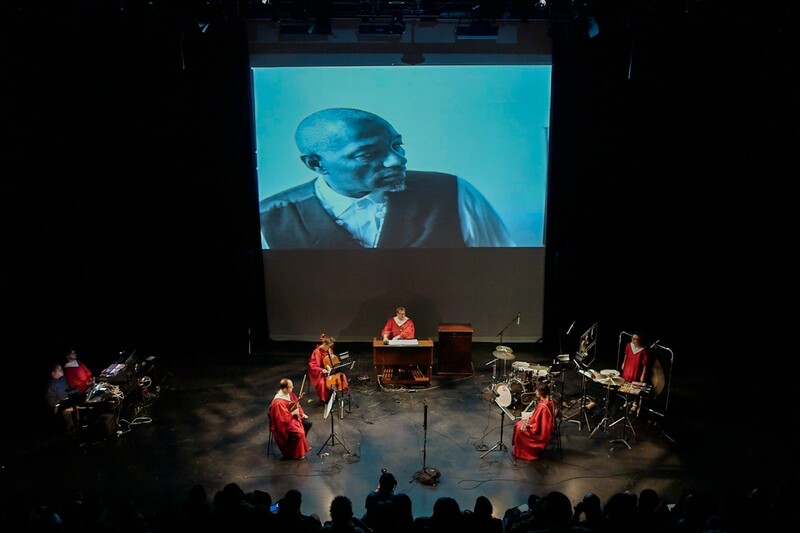 paggett's solo and collective performance have been exhibited in numerous institutions, including Danspace Project at St. Mark's Church (New York), Diverseworks (Houston), the Studio Museum in Harlem, Vox Populi, and the Whitney Museum of American Art for the 2014 Whitney Biennial. Her current ongoing installation and performance work, School for the Movement of the Technicolor People, begins from the question “What is a Black dance curriculum today?” She was the co-founder of the dance journal project itch, a former member of Ultra-red, and maintains an ongoing collaborative project with visual artist Ashley Hunt, "On movement, thought, and politics," which has taken form as a workshop, performance, video, and mixed media installation. paggett’s oscillation between dance and visual art can be seen in her works such as Decomposition of a Continuous Whole (2009, 2010, 2012, 2016), LET'S USE THESE THINGS (2012), and Underwaters (we is ready, we is ready) (2014). She is currently an Assistant Professor at the University of California, Riverside. ENDLESS SHOUT: taisha paggett from ICAPhiladelphia on Vimeo. The Otolith Group, People to be Resembling, 2012. The London-based Otolith Group was founded in 2002 by Anjalika Sagar and Kodwo Eshun. The Group’s name is derived from the ancient Greek word “inner ear,” the part of the body that allows humans to orient themselves in space. 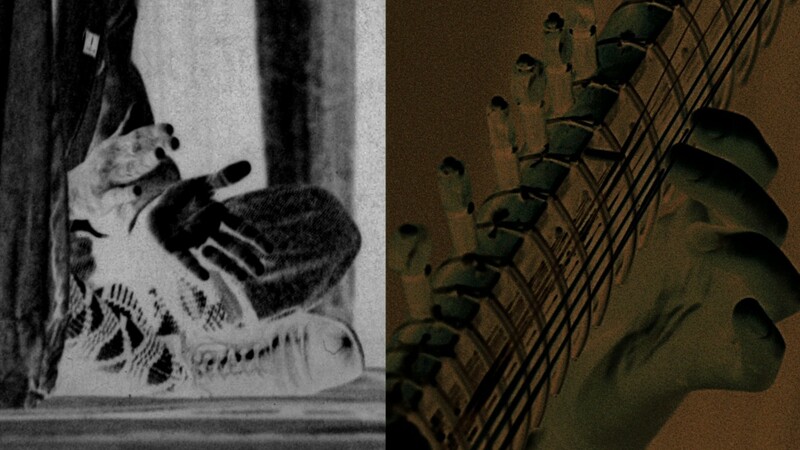 Throughout their collaboration, The Otolith Group has worked with moving image, the sonic, and the photographic to invent modes of narration that articulate conditions of futurity, mutation, abstraction, and mediality. Their recent exhibitions include Gwangju Biennale; MUKHA Antwerp; Yerba Buena Center for the Arts, San Francisco; National Museum of Modern and Contemporary Art, Seoul; Expo Leuven; Museu Berardo, Lisbon; EVA International, Limerick; Kunstmuseum Stuttgart; and Marrakech Biennale. In 2010, The Group was nominated for the Tate's Turner Prize. Filmmaker and visual artist Anjalika Sagar (b. 1968, London, UK), is one half of The Otolith Group. Sagar studied Anthropology and Hindi at the School of Oriental and African Studies, University of London, and Fine Art at Middlesex University. In 2000, she founded an independent news network called Multitudes that provides alternative perspectives on art, culture, and politics. Writer, theorist, and filmmaker Kodwo Eshun (b. 1966, London, UK) is one part of The Otolith Group. Eshun studied English Literature at University College, Oxford University. He is author of More Brilliant than the Sun: Adventures in Sonic Fiction, 1998, and Dan Graham: Rock My Religion (Afterall), 2011. Eshun lectures in Visual Cultures at Goldsmiths, University of London, and is Visiting Professor at Haute Ecole d'Art et Design at Geneva Course. ICA acknowledges the generous sponsorship of Barbara B. & Theodore R. Aronson for exhibition catalogues. Programming at ICA has been made possible in part by the Emily and Jerry Spiegel Fund to Support Contemporary Culture and Visual Arts and the Lise Spiegel Wilks and Jeffrey Wilks Family Foundation, and by Hilarie L. & Mitchell Morgan. Marketing is supported by Pamela Toub Berkman & David J. Berkman and by Lisa A. & Steven A. Tananbaum. Additional funding has been provided by the Horace W. Goldsmith Foundation, the Overseers Board for the Institute of Contemporary Art, friends and members of ICA, and the University of Pennsylvania. General operating support is provided, in part, by the Philadelphia Cultural Fund. ICA receives state arts funding support through a grant from the Pennsylvania Council on the Arts, a state agency funded by the Commonwealth of Pennsylvania and the National Endowment for the Arts, a federal agency. ICA acknowledges Le Méridien Philadelphia as our official Unlock Art™ partner hotel.